More often you loathe the smell of garlic in your mouth or the smell left on hands when you chopped it. For most Filipinos, cooking is never complete without garlic. It adds good taste with the food and for me, the smell when you saute it together with onion smells appetizing. More than as food ingredient, many studies have shown that garlic has a variety of health benefits. When I was growing up, i never loved to stay in the kitchen. In fact, on the first year of my marriage, I never cooked. I really do not like the smell in my mouth and the taste of garlic. I used to separate the garlic from my food in my plate. However, since my husband puts garlic on every food he cooks, I have learned to love it. But, we always hear our son constantly complaining about the dish if has plenty of chopped garlic, lol. I know eventually, he will get used to the taste as well. 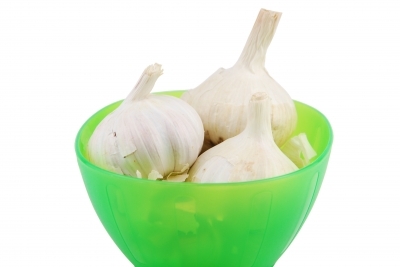 It is just that chewing candy or gum cannot totally eliminate the odor of garlic. 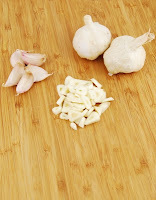 A friend told me, to remove the smelly breath of garlic, eat 1 tablespoon of raw parsely. I haven't tried it yet so I do not have an idea if it is effective. Apparently, there is a National Garlic Day that is being celebrated every 19th of April which started on Northern and Central part of Asia. I just thought that most people are not aware of health benefits of garlic. So, here I have listed some benefits we can get from it. Treats ailments from the cold. Treats acne because of its antibiotic and blood cleansing properties. Antioxidant enzymes that slows the aging process of liver. Reduces risk of high blood pressure. Reduces the risk of stroke and blood clotting. Taking too much garlic can irritate digestive system. There are also people who has allergy on garlic. You will know if you are allergy to garlic if you develop skin rashes after eating and experience headache. China is by far the largest producer of garlic. Garlic is a member of the onion family which also includes leeks and shallots. One clove of garlic daily improves health. 2-3 cloves helps prevent a cold. The fear of garlic is called Alliumphobia. I guess it is hard to imagine life without garlic. I hope this post can make you appreciate garlic more. I love garlic especially with vinegar and labuyo on ginisang mongo! Humanatic Earn from Home Listening Calls!